It’s a long wait for football season to start up again. But, the Indianapolis Colts in Motion doesn’t stop during the long summer months. 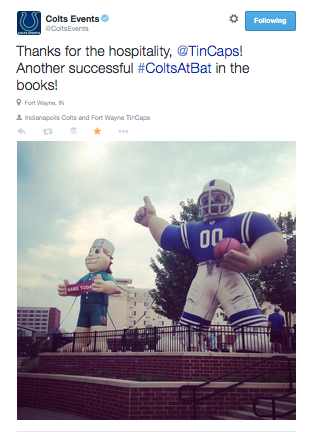 The traveling museum and interactive experience visits all around Indiana working with the Colts Cheerleaders, individual players, and most often, the mascot Blue and the Colts Superfan to support local events. The 42-foot long, great big trailer drives all across the state, from April to October, to visit communities and charities. Attendees of the event with the Colts in Motion get to see memorabilia and Colts history. 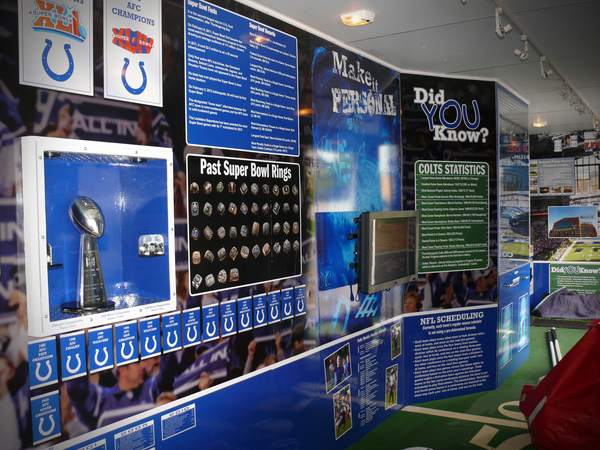 Features include the Colts Official Football 101 Playbook, interactive TVs, a replica Super Bowl ring, and jerseys worn during games. What’s truly great about Colts in Motion is the added provenance and visibility it can bring to charity events. During the month of June, the Colts in Motion visited: two Relay for Life races, an Alzheimer’s Association event, a Burn Foundation Event, a Bicycle Safety Workshop, multiple Fan Fests, a Strawberry Festival, the Hope to Dream event, multiple Community Days, county fairs, summer reading events, and many other benefits and festivals. Colts in Motion strengthens community ties and brings attention to a variety of important charities around the city and state along with giving fans something to tide the over before football starts up again. View a calendar of stops here. The Colts in Motion is free! The request form to bring the trailer to an event is here. The guidelines for an appearance are here.